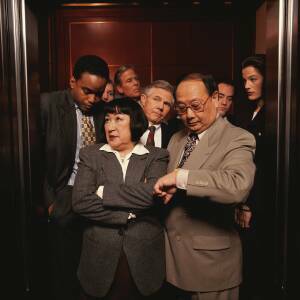 When should elevator speeches be grounded? Quite often I am asked to coach people through their elevator pitches and actually even have a section in my own coaching programme entitled just that. But I’ve decided only today to change it all. I’m not sure if I think it’s an outdated concept and perhaps in today’s climate calling it “elevator phrases” might be better. Elevator speeches are supposed to be the pitch you make in a 60 second ride in an elevator. It’s all your USPs, CARS and all sorts of other acronyms rolled into a zingy speed presentation that is supposed to nail that opportunity for a further meeting, leading to a golden future. But realistically how many opportunities do we get in every day life to have our 60 second moment of glory other than at a formal job interview, a business presentation or convincing someone to lend us money? Today especially, there is less tolerance in these tougher times of a hard, crass sell. In recent more egocentric times it was OK to talk about yourself for a whole minute, whether in an elevator or anywhere else for that matter, so that sort of routine could have worked. I’m not sure how well it would go down in the current economic climate. I suspect that if someone started now to spout about themselves in a crowded lift for 60 seconds straight, they’re likely to find themselves wearing their pod-mate’s latte by the time they reach their floor. I have a very good friend, a successful business man who always, no matter where he was, would introduce himself with a warm friendly smile, a firm handshake and his senior level job title and what he was currently working on. In business situations that was fine, lines are drawn in the sand and everyone knows where everyone stands. But it did tend to bemuse French waiters, his wife’s book club and his kids’ friends. That only took 15 seconds – can you imagine what would have happened if he’d gone on for a whole minute? The aim of any “elevator speech” is to get the person to engage with you. So think long term. At some point you have to establish what your primary objective is from the conversation, but also to have in mind a secondary goal, (fallback position) if the first option doesn’t work out. Sometimes you might only have a few seconds to figure that out at a chance encounter. What do you do when the person you really want to connect with professionally, is having her highlights done in the next hairdresser’s chair. True story! As her head is pasted with chemicals does she care that I’m an international executive search specialist with 20 years experience – well frankly no, she doesn’t. Is she totally interested in my thoughts on soft beige or dark blonde and Kim Clijsters winning the US Open. Absolutely. So the key ingredients are empathy and flexibility. So you clearly will not say the same things to the CEO of a company standing next to you at your daughter’s soccer game as you would if he was at a networking event. Your USPs and CARS therefore need to be organic and in your DNA and to come out in different formats. I think they are actually best in dialogue form – and can be initiated by you asking questions – not delivering a pitch. It is always good to find out about the person you’re talking to by asking questions. People generally like to be asked about themselves and they like you more for being the one to ask . You have to accept the fact that rarely is anyone offered a job or opportunity on the spot, so make your primary goal, realistic and achievable. It might be to arrange a meeting, an interview, another opportunity to develop some points or simply a networking contact. Sometimes you have to be strategic. Set in place your mental secondary goal, a contingency plan if your primary goal is not successful. It might be to exchange business cards with a suggestion for contact at some future date ( the hairdresser situation) or to ask for a referral. It’s always good to come away with something from a networking situation – however small. Most importantly it should sound effortless, conversational and natural. There are also times when it is important not to make your pitch – that sounds like pretty poor coaching but you have to weigh up if making a pitch at the wrong time will have greater collateral damage than not making it all. This is not to be confused with chickening out through nerves! Recently I ran into my local deli on the way back from a gym session. No details required. You can imagine how I looked. Covert ops like this are always a high risk activity, but a vital ingredient was needed for dinner. Who did I see perusing the gourmet gateaux , but someone I had wanted to set up a meeting with for a long time visiting his sister, my neighbour. I promptly ducked behind the asparagus tips and fresh red berries. That was strictly strategic, not chicken. I did refer to it in a later email and got my meeting. So how do you know what to do? Understand well your own success stories and learn how to articulate them succinctly. Make your pitch memorable positive and sincere. It should reflect you. Practise – mirror, pets, partners, kids – doesn’t matter. Anything that won’t laugh. Think of it as part of a dialogue, so create a list of Socratic questions that will prompt your listener to ask you questions in return to keep the conversation going. This is not just about you! Listen attentively ( para-phrasing) . You can drip feed your USPs drop by drop! Elevator speeches must be flexible. Don’t get into auto-pilot mode regardless of the circumstances. Don’t let your speech sound robotically rehearsed. Maintain eye contact with your listener. If their eyes glaze over you’re doing a bad job. Smile. Try to be warm, friendly, confident, and enthusiastic.Take it slowly. Don’t ramble. Rambling is boring! Avoid industry jargon, or acronyms that your listener may not understand unless you are in a professional setting. End with an action request, such as asking for a business card, interview appointment or possibility to call. Update your speech ideas as your situation changes. Practise your telephone technique by leaving a message on your own answer machine. How do you sound? Awful? Then you probably are! Try again! I am not saying bin your power elevator speech all together, what I am suggesting is break it down into component parts that can be interchangeable and learn to use each of them flexibly, with discretion. Sometimes six, ten second comments will get it done too. Short can definitely be sweet! This entry was posted in coaching, elevator speech, job search strategies, Kim Clijsters, networking and tagged Career Coach Brussels. Bookmark the permalink. Your advice makes good reading. I am one of the renegades who never developed an elevator ‘pitch’ as I too have always believed that circumstances dictate any conversation, however short. Believing in yourself and your own abilities makes the approach you describe so much easier. Hi Susie – thanks for your comment. I agree it is important to find an effective way of communicating that suits us as all as individuals – but also to be empathetic to the situation and the listener! What a smart post my dear,probably one of the nicest post i read in a while.Love the content as well as the way you express yourself. You are so right, whatever we do we need to get ourselves out of the way fist.Definitely talking about ourselves for a whole minute when we just meet someone as you say not OK,probably would be more effective to learn more about the other person. I like everything,just a great read Dorothy.Thank You. Hi Lorena – thanks for your kind words. Flexibility is key – humour is important too – glad you appreciated the post. Agree totally with the need for being succinct and being able to say what you do and be of interest. Yet, these are two things that are really difficult when starting out. So, I add take a step back and have empathy with the person in front of you… learn about them as a way of gathering information you can use to create your elevator speech. It took me six months of bumbling before I got anything that was, in any sense, coherent! Well done Dorothy. Funny picturing you as not a chicken among the asparagus. Your post sparked a related thought. Offer people an appetizer so they want to come back for the full dinner. Listen carefully so you choose just the right one for them at that moment in that place. Thanks Anne – perhaps less funny though than me in my post – gym glory in front of the asparagus making a pitch in appropriately! The point is that timing plays a signficant part. Being aware of the impact of the surroundings and situation is key!